I really enjoy drink water. I don't like the ones with added colors or flavors, I love the taste of good old fashion water! Over Labor Day weekend we went to a outdoor event and it was a hot day. I decided to bring Resource® Natural Spring with us to drink to stay hydrated. There is no flavor of this water, thankfully, but it is very refreshing. Not sure if its the natural electrolytes or what. I read the label and was curious about how the water had natural electrolytes so I asked! This is what they said: "Other water brands actually add in electrolytes to their water. However, the water we source resource Spring Water from has naturally occurring electrolytes. Our source is a natural, real spring in North America." Love that!! I want my water to just be that, water! "It is more than just hydration, it’s Total Electrolytenment™. 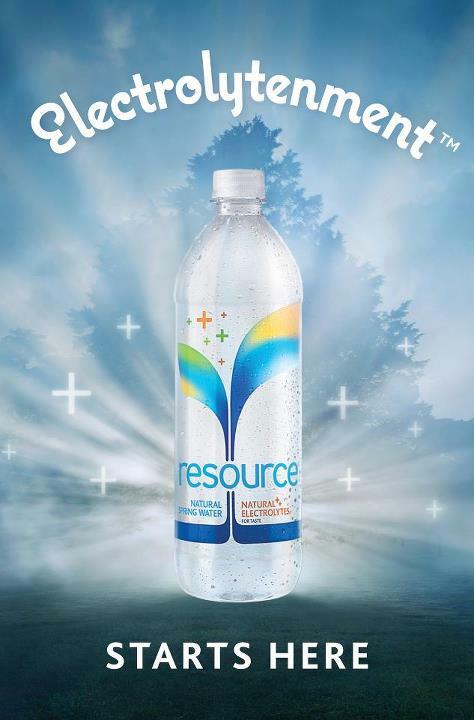 Electrolytenment™ is about living a more enlightened and holistic life.–"
Resource Natural Spring Water wants you to have a relaxing time before you grab a bottle of water so they are offering a $25 Spa Week Gift Certificate to one of our lucky readers! in the car, on the run!! When i'm on the road. I would take Resource water with to the garden to stay replenished while I work. Also, I would take it to work to drink instead of sodas.